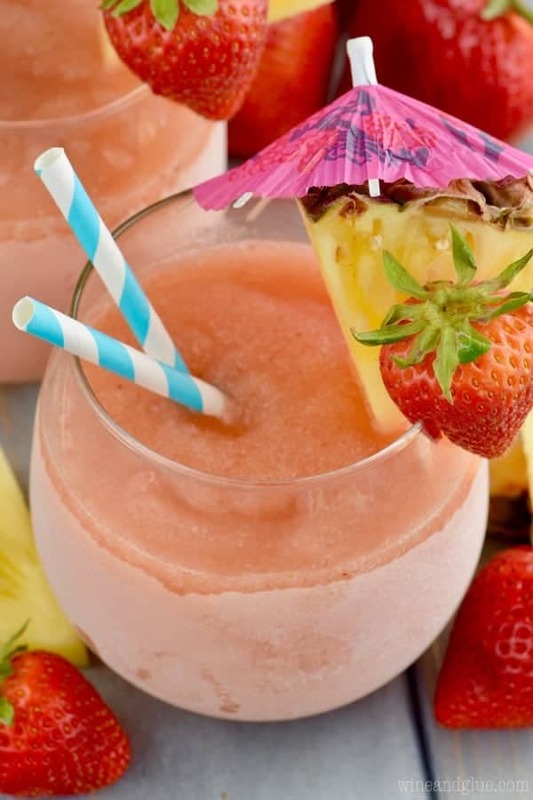 This Frozen Sangria Slush is just five ingredients, comes together in the blender, and will be the hit of the party! Make a double batch! That probably gives you some sense of how my summer, working from home with all three kids, is going. Work is definitely on the back burner this summer and I’m kind of loving it. The kids and I have a ton of fun things planned, and we magically keep finding things to do that we didn’t plan. Over the weekend we popped into our local library to pick up some books and they had baby cows in their courtyard! June is Dairy Month in Wisconsin, so a local farm brought three calves and a mama cow and some ice cream! Score! Piper and I considered bringing one home. Before that we were at the Farmer’s Market where this older couple were selling these massive bubble wands with a recipe for a fool proof bubble solution. So we came home and made giant bubbles in our driveway! This summer is turning me into one of those moms that recounts their kids’ lives in minutia detail. Help! My dad is for sure the only person still reading this post. Sorry, guys. Let’s talk about Frozen Sangria Slush. 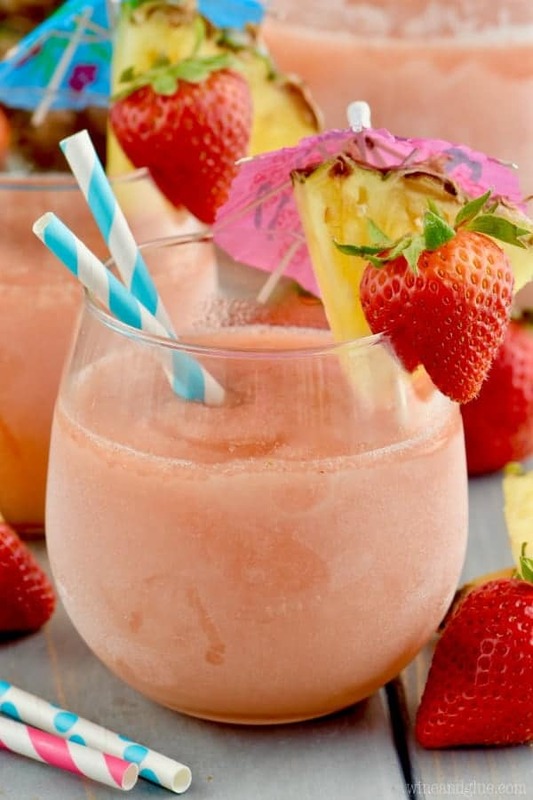 Or should we call it Sangria Slushies? Either way, this cocktail is easier than easy. Grab a bottle of white. I used a sweet moscato, but you could go with something more dry if you aren’t into the sweet. Then add in some rum and some triple sec. 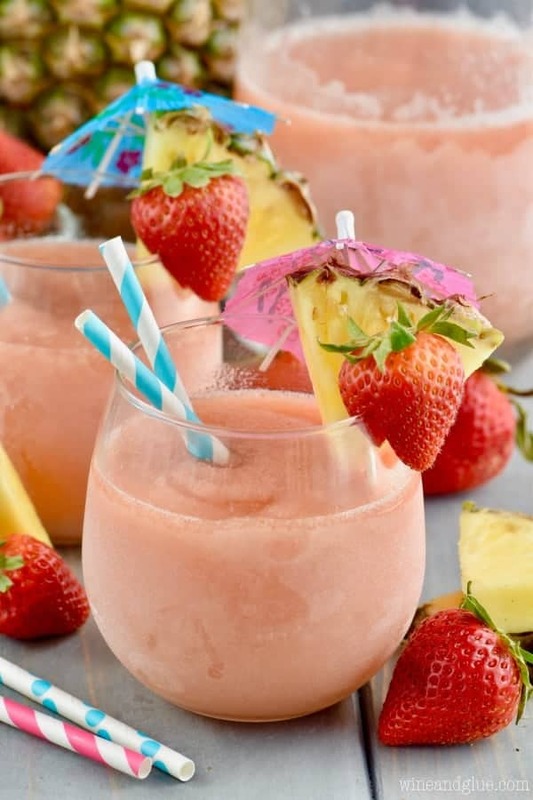 Throw in a few cups of frozen fruit. I went with strawberry and pineapple here, but you could pick other fruits. 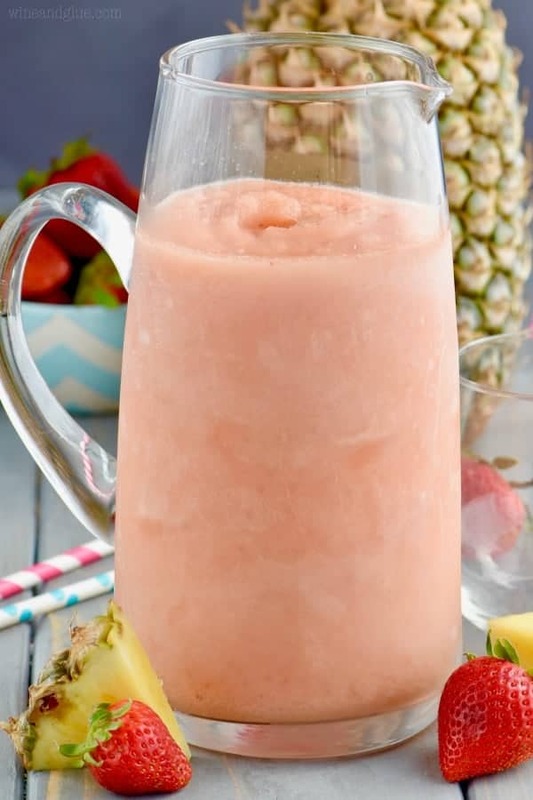 Mango and pineapple would be a great combo, or just go with mixed frozen berries. Blend it all together, freeze it over night, blend again, and serve. You can skip that process if you want. It just won’t be as slushy. You know? Cheers to a fun summer, guys! ???? Click hear for more Sangria Recipes. Pour into a freezer proof container (like a large tupperware). Freeze overnight or at least four hours. Put back in the blender, blend for about 30 seconds and serve! Other sangria recipes you will love! This Apple Pie Sangria would be perfect for the Fourth of July! 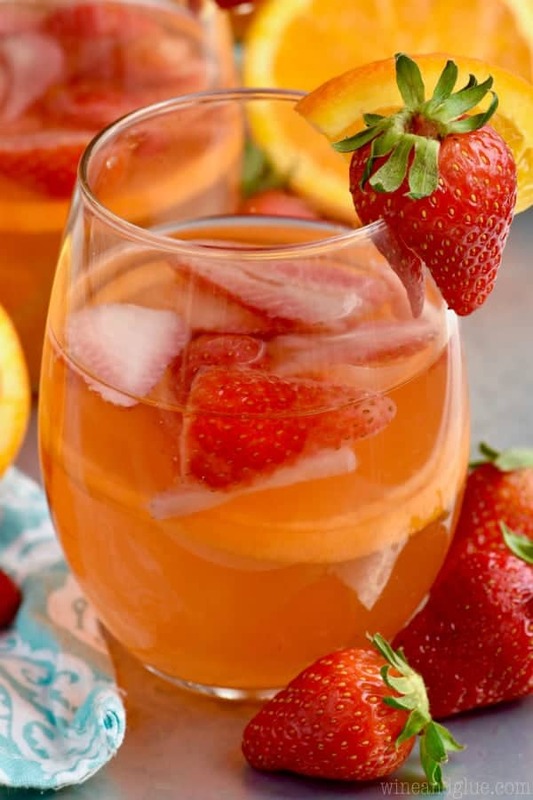 This Cherry Orange Sangria looks amazing and, omg! Fresh Cherries! Yum! 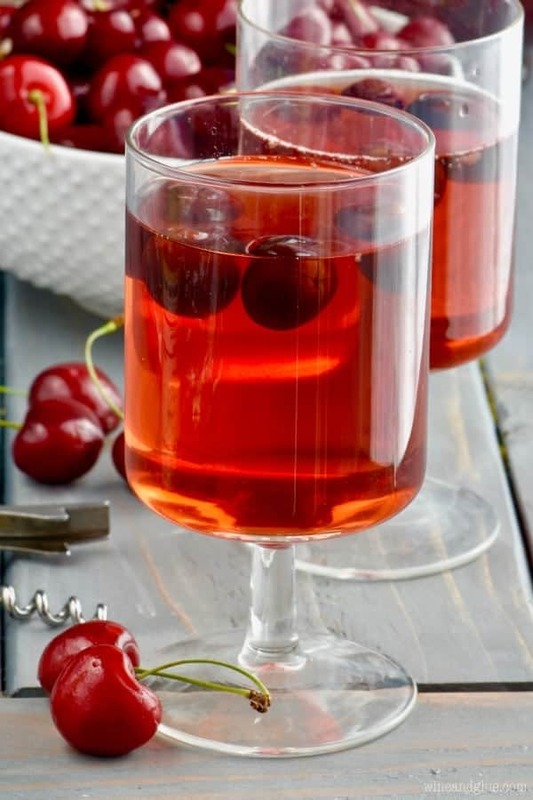 If your friends are big Rose fans, you need to make them this Summer Cherry Rose Sangria! Monday morning starting off with booze! You know I love the way you think! And two booze recipe in a row, awesome. This is so pretty and I’d love a big glass of it! Monday morning ???? You know me!